Welcome to the universe of the Far Future! Far Future Enterprises, as the successor to Game Designers' Workshop, publishes reprints of the classic role-playing game systems originally produced by GDW: Traveller (as well as many of its licensed support materials), 2300 AD, Twilight: 2000, and Dark Conspiracy. We work closely with other publishers (Mongoose, Steve Jackson Games, RPG Realms, Seeker, RPGNow, and DriveThruRPG) who publish their own versions of our products under license from FFE. 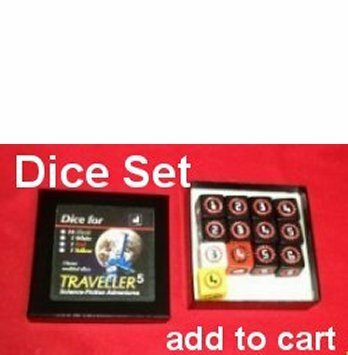 T5 Traveller5 is the ultimate (the 5th) edition of the Traveller role-playing game. The 656-page hardcover Core Rules covers a wealth of information about the universe of the far future and the fabled Third Imperium. The companion CDROM provides the entire text as searchable and printable PDF. Export Shipping: If you are ordering from outside the USA, we will bill you for additional shipping if needed. For CDROMs, we generally can ship without an additional charge. 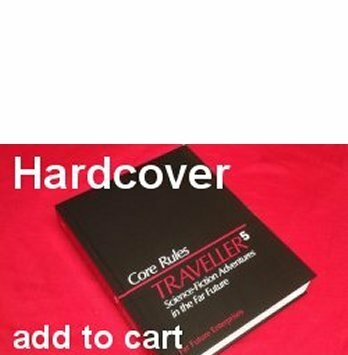 BUT, the six-pound Traveller5 Core Rules Book (alas) entails a shipping charge of $60 (slightly less to Canada). We've looked. There is no cheaper way. 443 Sale! Order any 4 CDROMS and we'll rebate $35 as a PayPal refund (the reprogramming logic is otherwise unfathomable): you're getting four CDROMs for the price of three. Far Future Enterprises, 1418 N Clinton Blvd, Bloomington, IL 61701 USA.